When I was pregnant with Little One, I remember one of the first things I looked at in the shops was a Grobag from the Gro Company. 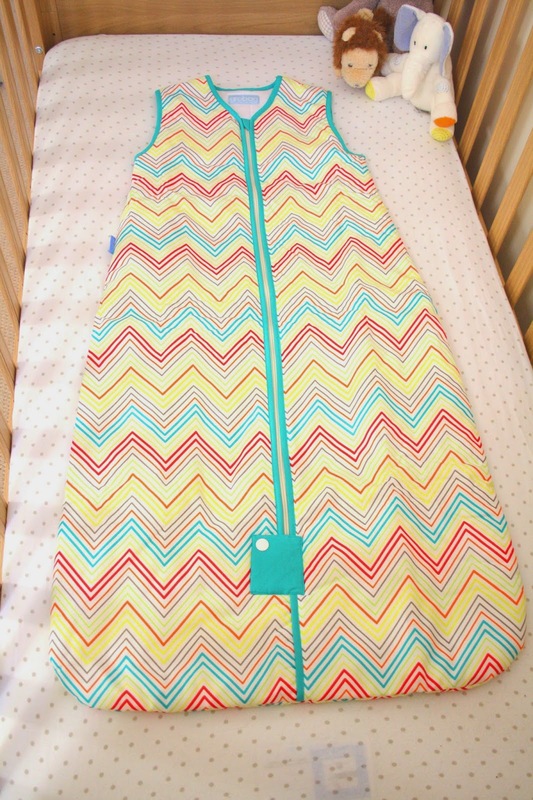 I thought they looked fantastic, the designs were bold and colourful and the design meant that once he was in a cot, I wouldn't need to worry about him climbing out or him covering his face with a quilt or duvet. When Little One was in his moses basket, I used cellular blankets but in the morning he would have always kicked them off and he wouldn't be covered. I always got up in the night worried about him being cold, and would put his blankets on again. It was quite exhausting. I knew that as soon as I transferred him to a cot at 3 months (and once he had reached the minimum weight requirement of 8.8lbs to use a Grobag) I'd definitely be going back to buy one of the Grobags I'd seen when I was pregnant as it'd solve the problem of the blankets being kicked off. Fast forward 13 months and we have never looked back. We, along with 95%* of parents in the UK have used Grobags since Little One was 3 months old and has slept soundly every night. While I'm sure we can't attribute this solely to the use of a Grobag, it has certainly played a major part in keeping him a comfortable temperature throughout the night. Not only this, placing him gently into his Grobag at nap time or after his bedtime milk has become a bit of a ritual which Little One has become used to, and knows it means sleepy time. Given our successful history with Grobags, I was delighted when Gro Company got in touch to ask if we'd like to try one of their 2.5 tog Grobags. We live in a fairly cold house and find that it's just the right temperature for his room (which has ranged from 14 deg to 18 deg this winter). We were sent the Tribal Travel Grobag. 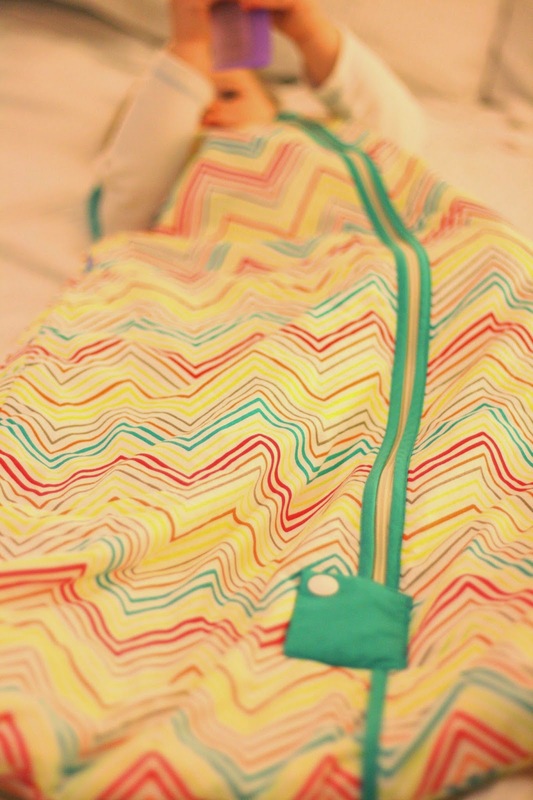 The design is classed as unisex and features bold candy zig zags. The colours are gorgeous and very striking. The design of this Grobag is slightly different to others we have used previously in that there are no poppers on the shoulders. This does mean that if we were to lay him down in it asleep, we'd have to manoeuvre his arms into the arm holes whereas with poppers you can easily pop them over the shoulders while baby is asleep. The Grobag is front opening with a two way zip system meaning you can zip it from top to bottom or bottom to top. This is a a very handy feature as it means you can unzip from just the bottom if you need to change them in the night without needing to take off the whole Grobag. There is also a zip-click feature at the bottom of the zip so adventurous little ones can't try to unzip the Grobag themselves. The Grobag I was sent includes a travel feature which means a 5 point harness can be used through the Grobag. It features a velcro sealed hole in the back, through which can pass the clasp of the 5 point harness. It can then come through a gap in the two way zip system on the front. 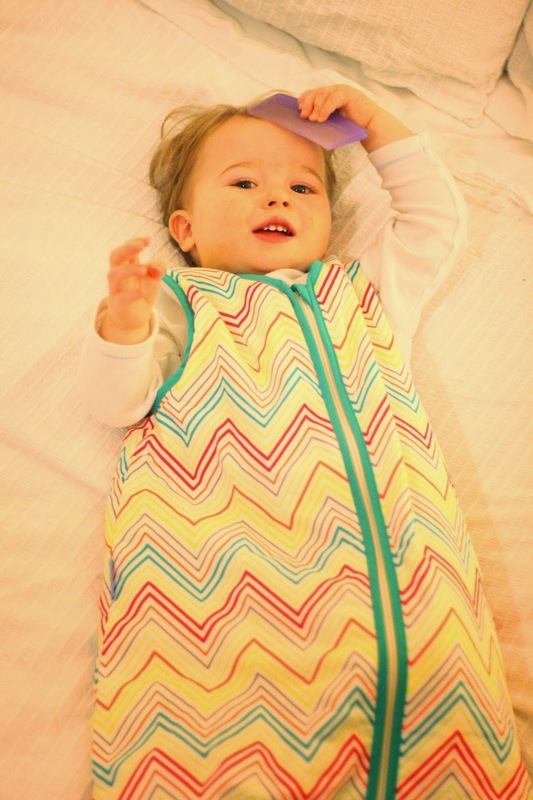 This travel feature enables your baby or toddler to sleep comfortably in their Grobag whilst in a pushchair or carseat. The material is very soft and the 2.5 tog has a quick dry polyester filling (very useful for those days when the nappy might have had a little leak and you need to get it in the washing machine asap!). On that note, the Grobag is machine washable and can be tumble tried on low.The Tribal design is available in 2.5 and 1.0 togs in sizes 0-6, 6-18 and 18-36 months. Overall, we are thrilled with the Grobag. So far we have just used it as a normal night time Grobag in his cot and tested it out in his pushchair but are looking forward to trying out the travel feature when we go on a long drive to Somerset next week. 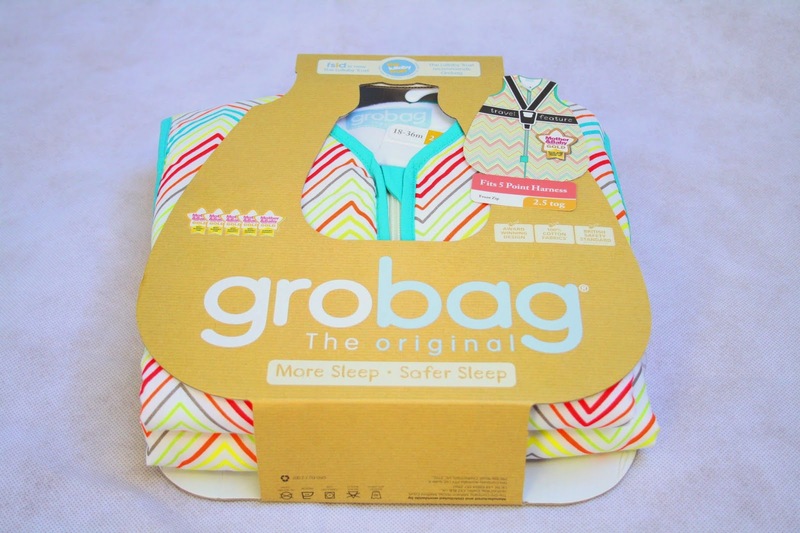 The Tribal Travel Grobag is available from £25.99 from the Gro Store. To see this along with a fantastic range of other lovely designs in the 2.5 tog range, please visit The Gro Store. 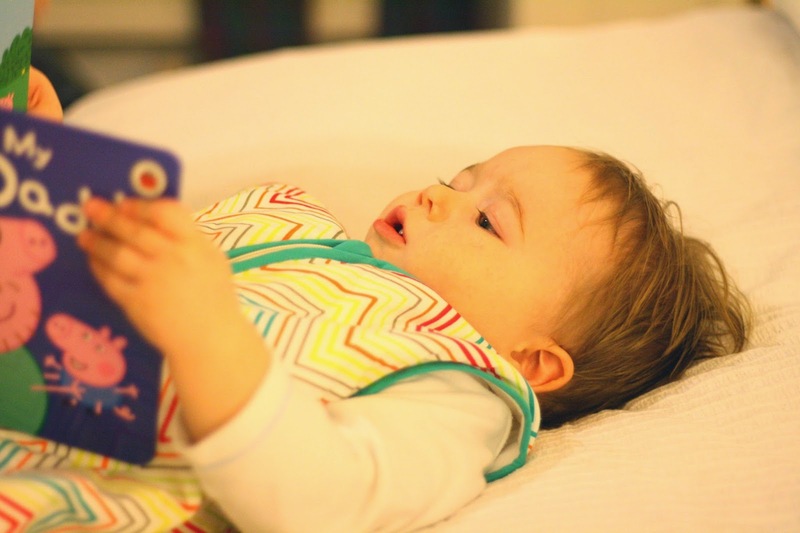 Disclaimer: I was kindly gifted the Grobag from the Gro Company but I was not paid or sponsored to write this review. As always, all opinions expressed are my own. * Statistic taken from The Grobag website. We have used Grobags for years now, with all the children, and Max still loves his. The design on this one is gorgeous! Moving to another location Bharat Packers And Movers Pune To Bangalore is a bit exciting and a bit hectic task for the people. It is exciting as they are moving to a new place and, are going to enjoy the new location atmosphere. But at the same time it's a hectic task because we need to relocate our properties to the new location. The first time I stayed in Hotel Amanjena on one of my travels in Morocco, it made me think of coming back and staying there the next time I come for a visit. I think this hotel is one of the most exquisite hotels in terms of Tour Travel Hotels that I know. It's the first Aman resort in the African continent and it certainly lives up to its name that means "peaceful paradise". This is what I consider to be essential items for any section-by-section article These are items which I have used in my past travels, and have served me well.